It is a bank, but not as you know it. Yes, it has electronic security doors. Yes, there are cameras watching every angle. And, Yes, barbed wire surrounds the perimeter. But in this bank, you do not see any cash or diamonds. Instead, the deposits here have a different kind of value. So valuable that, just like other banks, it has been robbed. Three times. And what is in this vault? Parmesan cheese. Lots and lots of it - 300,000 blocks or "wheels" of Parmigiano-Reggiano cheese, to be precise, stored on giant shelves. Parmigianino Reggiano is the prince of Parmesans. It is why all the cheese here is worth about $200m (£122m). "It's like gold," says Alfredo Germini from Credito Emiliano, or Credem, the bank in northern Italy that owns and runs the vault. The bank is sitting on this pile of Parmesan for a purpose - it is running a cash-for-cheese loan scheme. In simple terms, it will take the cheese from local Parmesan makers in exchange for a cheap loan. 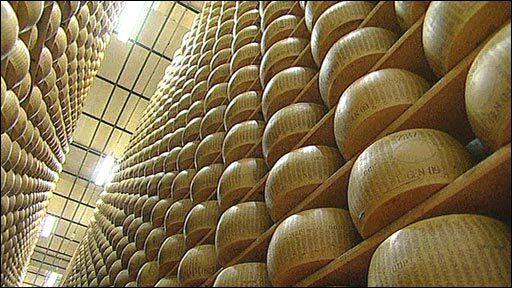 The bank charges interest at about 3% and a fee for looking after the Parmesan in its air-conditioned, humidified vault. In return, the cheese maker gets his hands on bank funds to see him through the long period it takes for the cheese to age and be ready for market, but a time during which he still has to pay wages and other bills. If the cheese producer defaults on the loan, the bank has the cheese to sell. 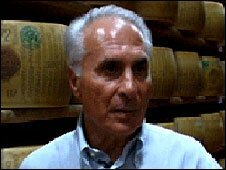 "We help finance the Parmesan cheese makers because their cheese takes two years before it is ready for sale," says Credem's Alfredo Germini. "That gives them a cash flow problem. So we take their cheese in return for a cheap loan." Credem has been doing this for about 50 years, as its way of helping sustain local agriculture. It is a kind of one-way barter system of bygone days that still works today. In the past few years, with economic pressures on the cheese makers, it has come into its own. 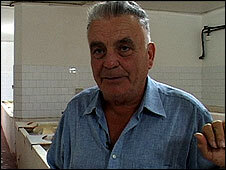 Giovanni Gualdi is 71. Just like his father before him, he has been a Parmesan producer all his life. He has a herd of cattle to feed, and staff to pay. As he waits for his cheeses to be ready, he needs a special kind of loan. For him, the only collateral he can offer a bank is his cheese. So he hands over about 1,000 wheels of Parmesan a month and gets his loan with which to carry on his business. Giovanni said: "It has been a difficult five years. The market has been very bad. Businesses here have spent money, so they rely on the loans, otherwise they would shut." In fact, in the past five years, more than 100 makers of Parmigiano-Reggiano have closed down. 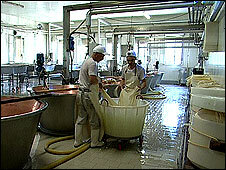 In his cheese making rooms, hundreds of the round yellow wheels of Parmesan bob up and down in huge baths of salt water. Later they are dried, stored and stamped with a branding iron before being sent to the bank. It is a slow, laborious process, one that has not changed in centuries. Next time you are sprinkling delicious, crumbly, Parmesan on your pasta, it might be worth remembering it may only be there because of a creative form of financing for those who make it. A highly specialist cheese backed by a bank that takes a mature attitude to lending.